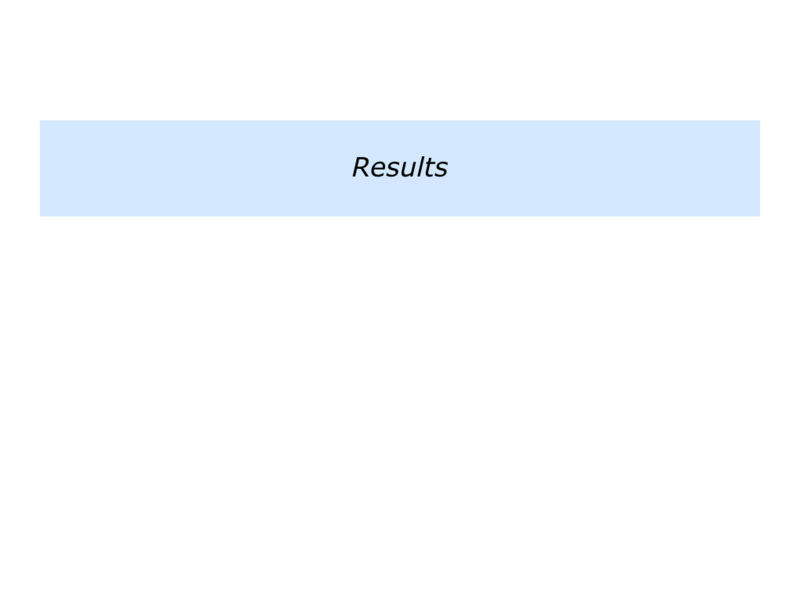 Imagine that you lead the team you may be working in at the moment. Let’s explore how you can use this approach to deliver the goods. Good leaders start by clarifying the results to achieve. You will do this in your own way. If you are working in an organisation, however, you may go through the following steps. To agree with your stakeholders, your bosses and other key people, on the results to achieve – the picture of success. To agree on a template for the results – many companies focus on their profits, products and people – and use this to build the picture of success. To make sure you believe that – providing you and your team perform properly – there is a reasonable chance of achieving the picture of success. To make clear contracts about the support you will need to achieve the picture of success. To reassure the key stakeholders that you will proactively keep them informed about the progress towards achieving the picture of success. If you wish, try tackling the exercise on this theme. Describe the specific results that your team wants to deliver. Let’s return to the beginning and look at the resources you have available. When looking at the team, it can be useful to ask the following questions. 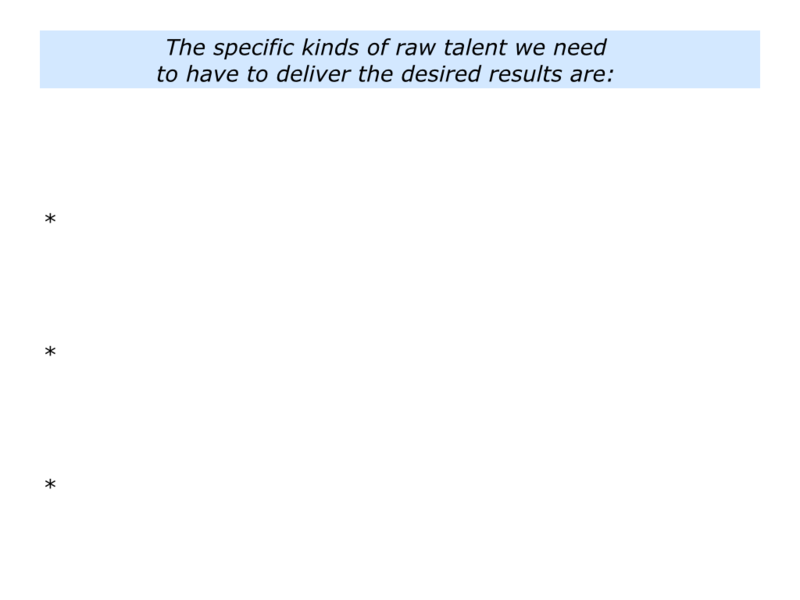 What are the kinds of raw talent we need in order to deliver the results? 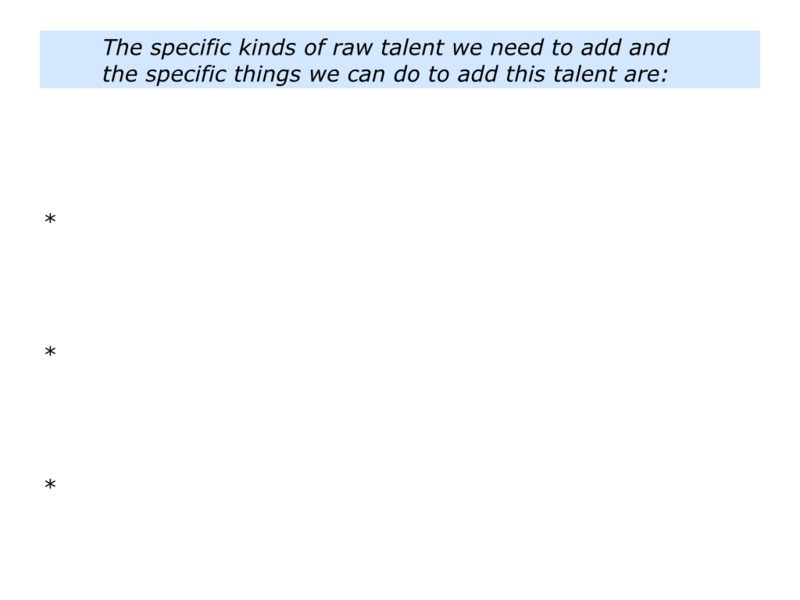 What is the raw talent we already and how can we build on this talent? 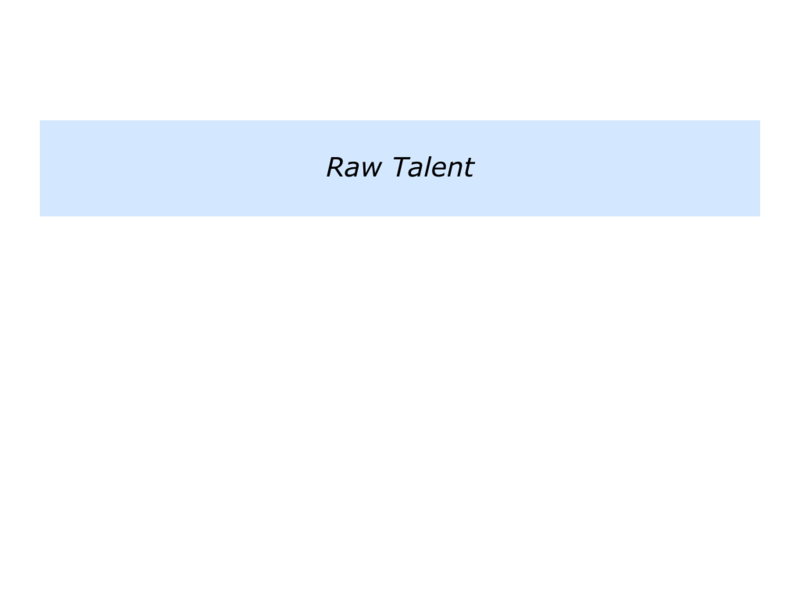 What is the raw talent that we need to add and how can we add this talent? 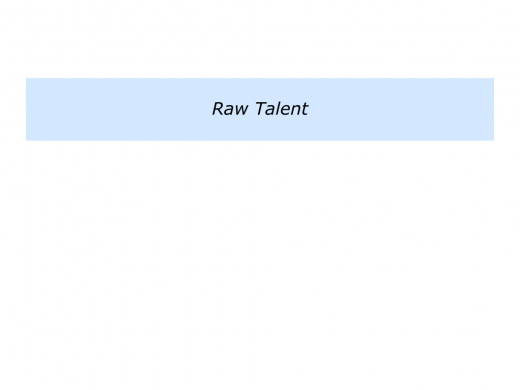 Good leaders keep focusing on the talent stream. The leader of one pacesetting company explained why this was important. 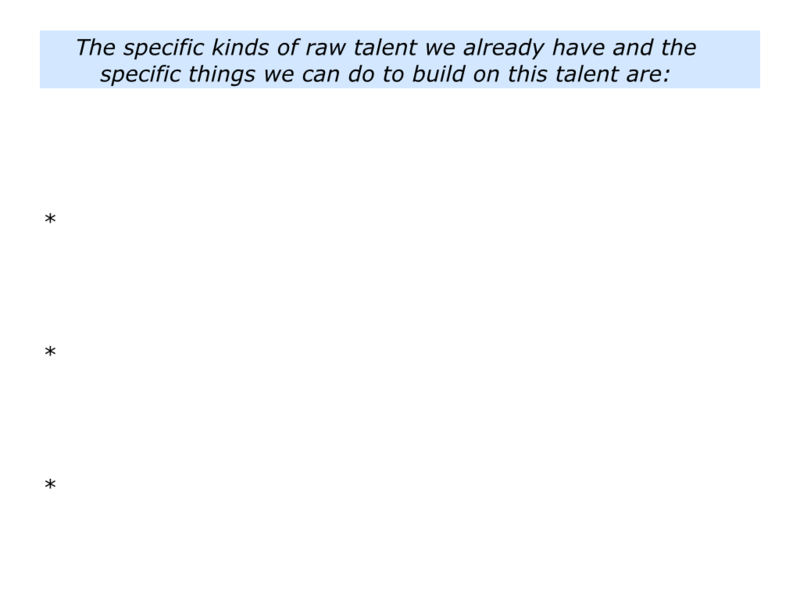 “We are always looking for talent. People in our company are highly respected in our fast growing market. They are constantly headhunted, which is as it should be. “We want our people to be attractive to other employers. We do not want people who nobody else wants. 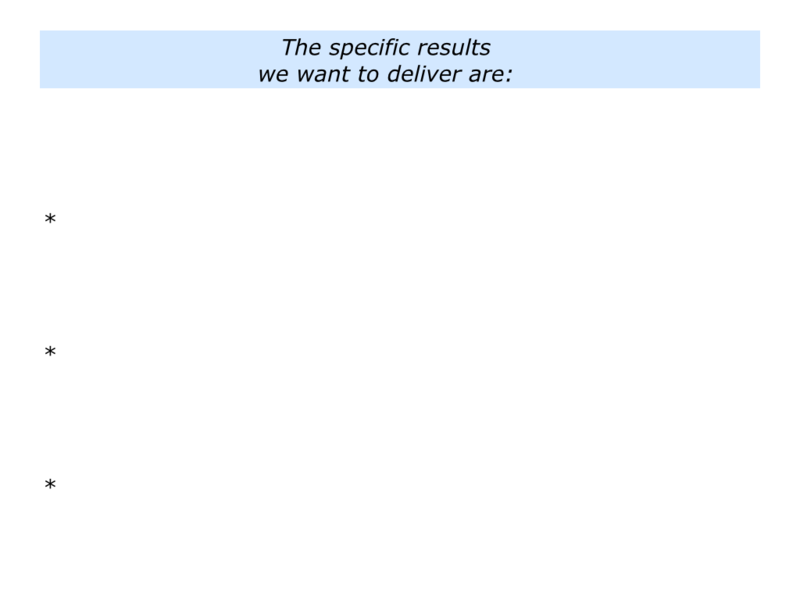 So this means there is a constant throughput of people moving to leading jobs in our field. 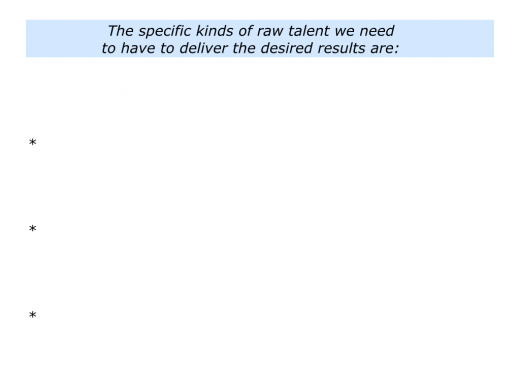 Describe the specific kinds of raw talent your team needs to be able to deliver the results. Describe the specific kinds of raw talent you already have in the team and how you can build on this talent. 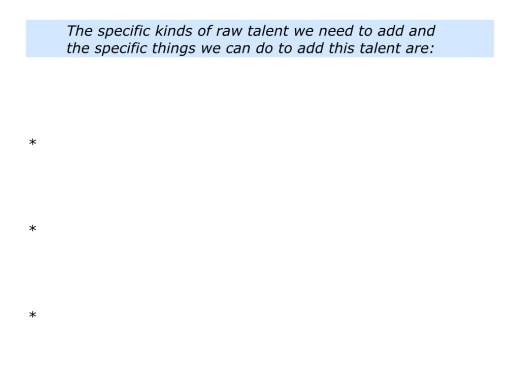 Describe the specific kinds of raw talent you need to add and how you can add this talent. Good workers have elements of OCD. (This is Obsessive Compulsive Discipline, rather than Disorder.) 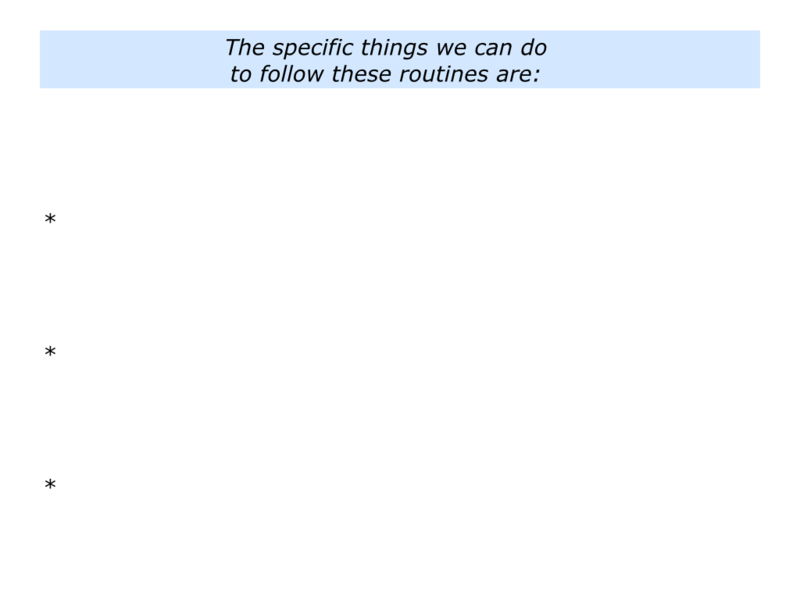 They aim to follow routines on the way to performing superb work. Good teams have similar characteristics. 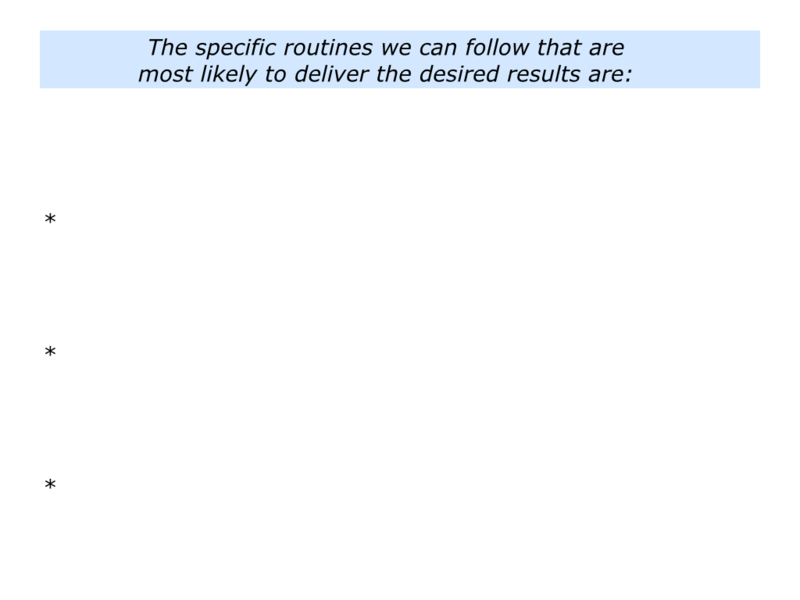 They have routines for everything and keep following these to get the required results. These routines embody certain characteristics. They are based on the key strategies people can follow to achieve the picture of success. They are based on encouraging people to express their talents but also ensure all the necessary practical tasks get done on the road to performing superb work. They are based on ensuring people keep doing the right things in the right way to increase the chances of getting the right results. 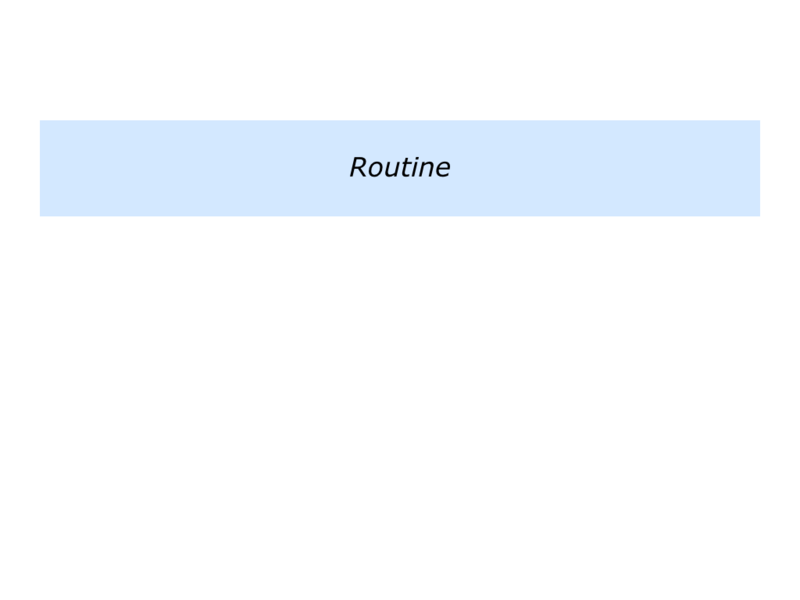 Good teams use these routines to continually deliver 8+/10. They also ensure their people have freedom to, when appropriate, add that touch of magic to help the team achieve 10/10. If you wish, try tackling the exercise on this theme. Looking at your own team, it invites you to do the following things. 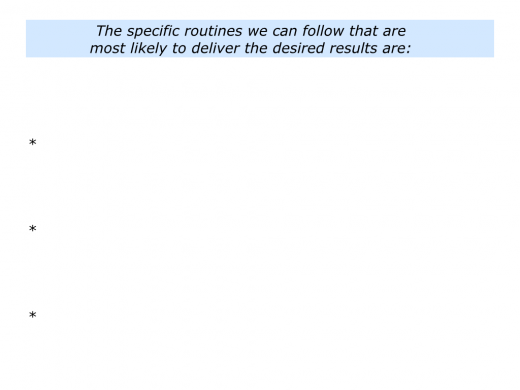 Describe the specific routines people can follow that are most likely to deliver the results. 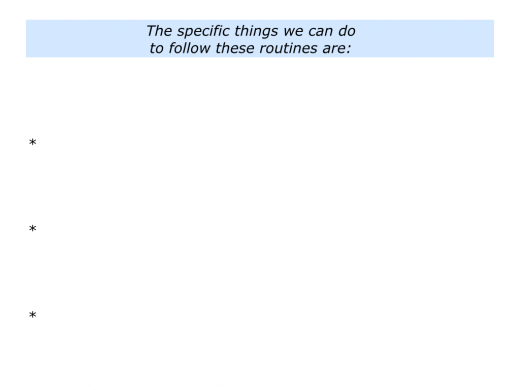 Describe the specific things people can do to follow these routines to deliver the results. Good teams keep building on their raw talents and following the routines most likely to get the required results. What if things start to go awry? Assuming that the actual results are possible to achieve, you can then focus on what you think it is possible to improve. Returning to the overall framework, you may want to again explore the following themes. 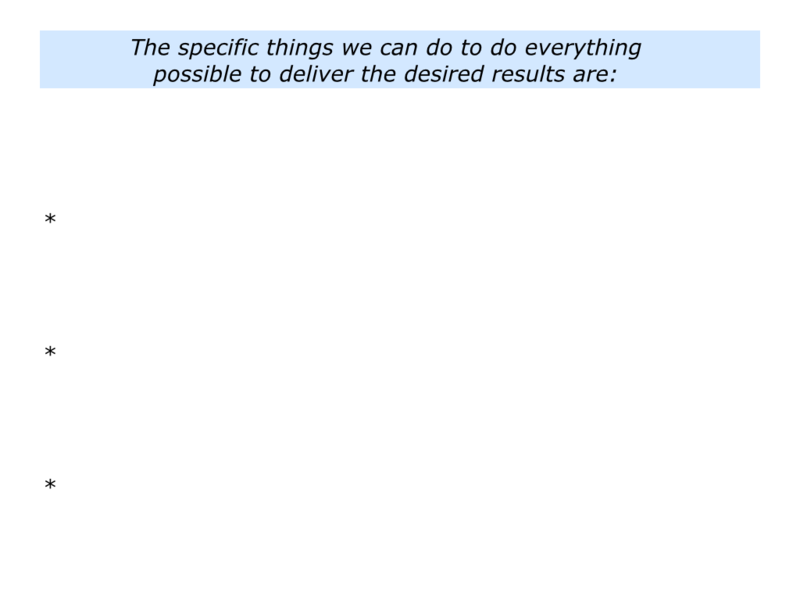 the right places required to achieve the right results is: ___ / 10.
following these in the right ways to achieve the right results is: ___ / 10.
possible to achieve the right results is: ___ / 10. One soccer coach, for example, felt that the team rated highly on both raw talent and routines. The team needed to add other things to its repertoire, however, to do everything possible to achieve the results. The players needed do their best on the big occasions. Sometimes they succeeded, sometimes they didn’t. They needed to learn how to employ their emotions, rather than let their emotions employ them. The coach brought in Olympic Champions to share how they had performed at their best. They showed how to focus on your own performance, rather than get distracted by sideshows. The Olympic Champions had credibility. The players listened and began applying the practical tools they had learned. They then performed well on the big occasions. 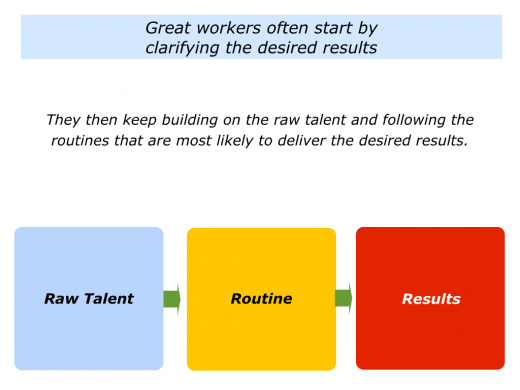 Good teams continue to build on their raw talent and follow the right routines. They then focus on adding other elements that will help them to achieve their picture of success. If you wish, try tackling the exercise on this theme. 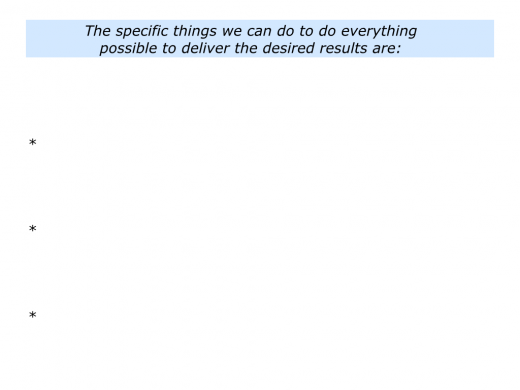 This invites you to describe how your team can do everything possible to achieve the desired results.